Let’s face it, with a name like Gumpert it’s hard to take a car too seriously. You sort of suspect it will come with a box of chocolates. But the Gumpert Apollo S deserves respect, it’s a rocket of a supercar and developed by the likes of an ex-Audi engineer who knows a thing or three about high-speed, low-drag sports cars. 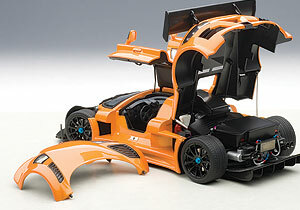 Autoart deserves some credit too for creating a 1:18 version of a car with about as much name recognition as you or I would have if running for political office. Credit them too for painting the review car a brilliant metallic orange that will add a bit of fireworks to any collection. 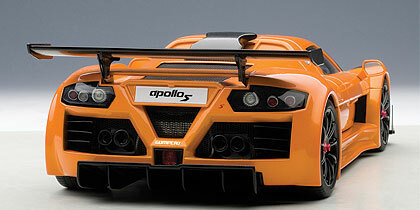 This Gumpert Apollo is a supersonic pumpkin on wheels. Roland Gumpert had worked for Audi-VW before he and Roland Mayer started Gumpert Sportwagenmanufaktur in Altenburg, Germany. Along with Marco Vanetta they designed two scissor-doored prototypes that were introduced in 2005. That same year the Apollo hit the racing circuits in Europe and scored a third at Hockenheim and by 2008 a hybrid version was racing at the 24 Hours of Nurburgring in Germany. The Apollo, the makers say, is a street-legal mid-engined race car, a two-seater that tips the scales at just 2,400 lbs. It boasts three engine choices, all based off an Audi V8. These are bi-turbos that crank between 650 and 790 horsepower and deliver a top speed of nearly 225 mph. Those turbos give it great torque and acceleration times, doing 0-100 km/h (62 mph) in 3.1 seconds. That’s quick! In fact, the BBC’s popular Top Gear TV show set their own track record with a Gumpert Apollo, beating the likes of Bugatti’s Veyron and Pagani’s Zonda. The rear-drive supercar rides on a tubular chromoly frame with fiberglass or carbon fiber body, depending on what’s ordered. Naturally these are all hand built. The Apollo rides on a 110-inch wheelbase and is just 43.9 inches tall. 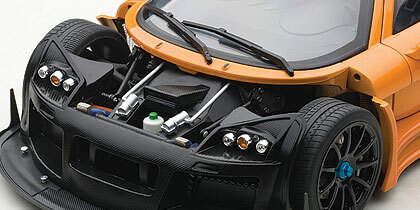 Yes, the Autoart model is beautiful because of its paint job alone, but there is considerable detail too. Start with the parts count; that always gives you some indication of the quality. This one has 479 parts of which 211 are metal and 38 are photo-etched. Each model gets 131 free-hand sprays to give it a thick glossy coat too. This is well beyond toy quality finishes. Autoart is generous with its black mesh grillwork and carbon fiber-look underpinnings below the easily removed nose section. Taking that portion off allows the collector to see three jewel-like headlights and orange hoses that collect air for the massive disc brakes, which are easily visible behind the racy black-spoked wheels with anodized blue center mounting nuts. Raising the rear bonnet to see the engine requires loosening a couple screws and then propping up the body work with a special strut. Makes for a dramatic pose, plus you can see the plumbing and wiring. I like the carbon fiber look giant rear wing here too and the diffuser on the car’s rear lower lip. There’s more of the black carbon fiber on the giant air scoop mounted on the roof and more black mesh grille work around the quad exhaust pipes and in air vents fore and aft of the scalloped area that cuts into the Apollo’s sides. The Gumpert’s interior looks fine with the gullwing doors open, but close inspection shows a gray hard plastic dash and seats that look very much like plastic due to their smooth texture. But there’s a shifter and black racing seatbelts to give it a more finished appearance. Hard not to like a beautiful low-slung supercar in metallic orange and with all the detailing this Gumpert Apollo offers. If you’re a supercar collector, this is an unusual model of a rare racer.